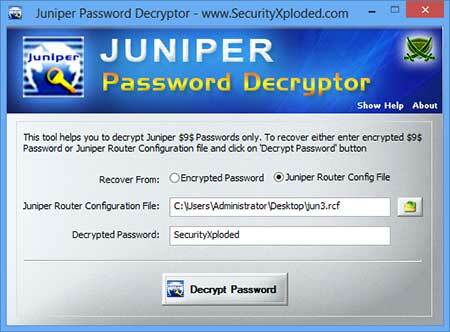 Juniper Password Decryptor is a free desktop tool to instantly decode and recover Juniper $9$ Passwords. Juniper $9$ Password: These passwords are encoded using Juniper's private encryption algorithm. Password hash starts with $9$ text & can be decrypted instantly. You can use Juniper Password Decryptor tool to quickly decrypt these Juniper $9$ passwords. It supports dual mode of password recovery. You can either enter the encrypted Juniper $9$ password directly or specify the Juniper router configuration file. In second case, it will automatically detect the $9$ password from config file and decrypt it instantly. This is very handy tool for all Administrators as well as penetration testers. It is successfully tested on both 32 bit & 64 bit windows systems starting from Windows XP to Windows 8. Screenshot 2: Showing Password recovered from the Juniper configuration file.